weblin proudly announces that it has been chosen by AlwaysOn as one of the AO Global 250 Winners. Inclusion in the AO Global 250 signifies major developments in the creation of new business opportunities in the global technology industries. Weblin was specially selected by the AlwaysOn editorial team and other industry experts spanning the globe, based on a set of five criteria: innovation, market potential, commercialization, stakeholder value, and media buzz. 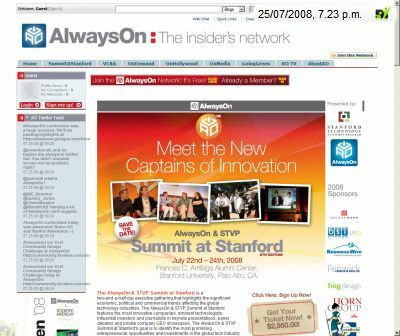 The AlwaysOn Global 250 Top Private Companies have been honored at the AlwaysOn & STVP Summit at Stanford on July 22-24, 2008 at Stanford University. Weblin´s GM North America Marc Theermann was there to network and talk to a lots of impressive start-ups.